In 2015, Congress enacted one of the most powerful conservation measures in decades: the enhanced federal tax incentive for conservation easement donations. The permanent conservation easement tax incentive is a powerful tool that helps Americans conserve their land voluntarily. For land trusts across the country, the permanent incentive represents vastly increased opportunities to protect the special places in their widely varied communities. Allowing qualifying farmers and ranchers to deduct up to 100% of their income, increased from 50%. 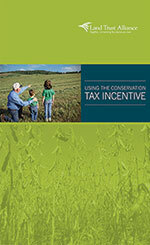 To learn more about using the conservation tax incentive, click here. There are many people to thank for the 2015 conservation tax incentive victory. We extend one grand thank you from the Land Trust Alliance to all of you. The Alliance has been leading a team effort to achieve this since 2000, when we convened land trust leaders from across the country to build a consensus on what tax policies would best address the need to expand land conservation. This legislation would not have happened without the leadership of Senators Dean Heller (NV) and Debbie Stabenow (MI), Representatives Mike Kelly (PA) and Mike Thompson (CA), and many of their colleagues. These leaders know that the conservation work of land trusts is important to their communities and broadly supported by their constituents. Download a printer-friendly brochure for landowners that summarizes the conservation easement tax incentive and provides answers to some frequently asked questions.